Ever wonder how much time is spent traveling to #MakeMoves as a service-provider and entrepreneur in fitness + wellness? Studio 26 recently initiated a series of focus groups to gain insights on behalf of fitness professionals in New York City to help them do what they love, and do it better. Our inspired network of independent trainers, pilates, massage and physical therapists was game to share a glimpse into the realities of being an elite fit-pro-on-the-move in a simple but graphic thought-exercise. RYU will be hosting an open house here at Studio 26 on June 21st from 4-5pm. RYU is an urban athletic brand that is "Beautiful enough for the office, tough enough for the gym." Celebrating Chelsea Small Business with Manhattan Sideways! We're honored to #TBT with this feature from Manhattan Sideways! Join us to celebrate local businesses in Chelsea with the Greater Village/Chelsea Chamber of Commerce as we host the Opening Reception of Manhattan Sideways' Photographic Stroll Through the Sidestreets of Chelsea, this Friday April 20th from 5-8pm! With a wine-tasting and small plates courtesy of 7 fab food finds, you won't want to miss this! Jared Kaplan strongly believes that while how you work out is important, where you work out is equally – if not more – important. 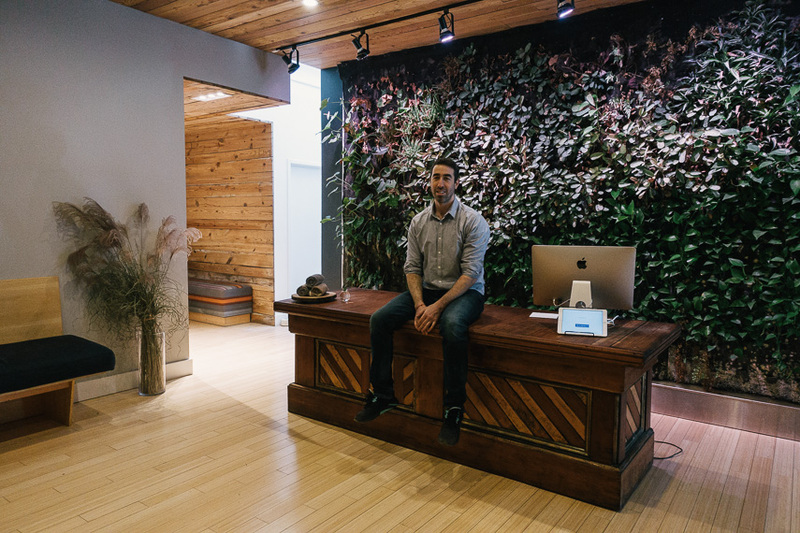 This is why he created Studio 26, a lovingly-designed gym with a clean and refreshing ambience, filled with plant life and eco-friendly equipment. Jared calls himself a “native New York City boy.” He worked for many years as a dancer before becoming a pilates instructor and personal trainer, a shift that he said “evolved organically.” After many years of training and studying his body, it was only natural to take that training into a health and wellness field. For many of his years as a dancer, Jared prided himself on having never been to a gym. However, after an injury, a physical therapist referred him to Pilates. His exploration of physical training continued when he got involved in more demanding choreography, which required him to do weight training at the gym. He eventually became an instructor, working at studios throughout New York. When Jared retired from dancing, he redirected his creative spirit into establishing Studio 26, his own space. Chelsea seemed like the perfect place, both because Jared’s client base was there and because people choose gyms and studios based on a sense of community – and he saw Chelsea as an amazing, vibrant neighborhood. It also helps that the Highline is nearby, a space designed using the same principles that Jared holds dear. In addition to the calming and beautiful environment that Jared has created, Studio 26 stands out because it is composed of a network of independent instructors with equally independent clients. There are no members and each instructor is free to manage their own schedule and style. The studio provides a support system and helps each trainer with the business side of things, but otherwise keeps things simple. As Jared put it, “We’re taking the pressure off and giving fitness professionals a platform to develop relationships.” These strong relationships are not only formed between instructors and clients, but between the team members at Studio 26. Jared has a lot of faith in everyone who works at the studio, which includes physical therapists, massage therapists, pilates and personal trainers. Mastery Package - make 2018 count! We're PSYCHED to offer 10 *lucky* peeps the chance to grab our "Mastery Package!" Save big while expanding deeply: experience both Centered: Practice - Finding Freedom - 4 Sunday workshops with Jennifer Sokolov - PLUS Madeline Black 5 Day Immersion with Madeline Black for the reduced price of $1750! Join us for some R&R: refreshments, relaxation, and referrals. Have a drink, engage in some self-care and get rewarded with a free session for bringing friends* to the studio. No eligible friends? We still want to celebrate your contributions to the studio! One lucky door prize winner will take home an R&R prize (more details to come). Don't miss our new Pilates Mat class series with Emily Sanderson! Classes will start November 11th and be every Tuesday and Friday until December 6th. Classes are $30 and will be one hour long, 2pm - 3pm here at Studio 26! Emily Sanderson discovered Pilates after 13 years of dancing, and quickly realized it was exactly what her body needed to stay balanced and injury free. She took her first mat Pilates course in 2007, earned her B.A. in Kinesiology from Occidental College in LA, and went on to receive her comprehensive Pilates Certification from Body Arts & Sciences International. She has worked with clients ranging from 12-year old athletes to 80-year olds looking to exercise for the first time. She is interested in Pilates as a method of retraining natural movement and cross-training for life! This 4-week series will give students tools to both address their overall balance and strength as well as focus on any problem areas of weakness or pain. Each mat-based Pilates and movement class will give students exercises they can easily use at home or while travelling without any need for props. The sessions will consist of whole body movement - challenging strength and muscular endurance while also allowing time for extra focus on particular areas of the body that can be sources of pain or movement malfunction - feet, pelvis, spine, and shoulders. Clink on the link below to sign up! Email us at desk@studio26nyc.com or give us a call at 646-755-8125 with any questions. In case you missed it, here's Movement Specialist Jared Kaplan with Health.com's Livestream on Facebooḳ sharing tips to reduce neck strain ("text-neck!") and eye fatigue, restore upper spine function, and how over-scheduled New Yorkers (who...you?!) can improve both how they feel AND look. Check it out and come on in for a private session with one of our expert trainers + practitioners! EXCITING NEWS: we're now an official host site for Pilates Teacher Training via Balanced Body's University! Join us to study with some of the best movement educators around, starting this weekend w Joy Karley and in December with Lesley Powell! Join this smiling bunch of Mat 1 graduates as we kick-off our Pilates Teacher Training! Joy Karley is back at it! Teaching Mat II September 17-18th at Studio 26! 6th Anniversary and Expansion Party! Join us for a night of festivities on Wednesday, June 8th, 2016! 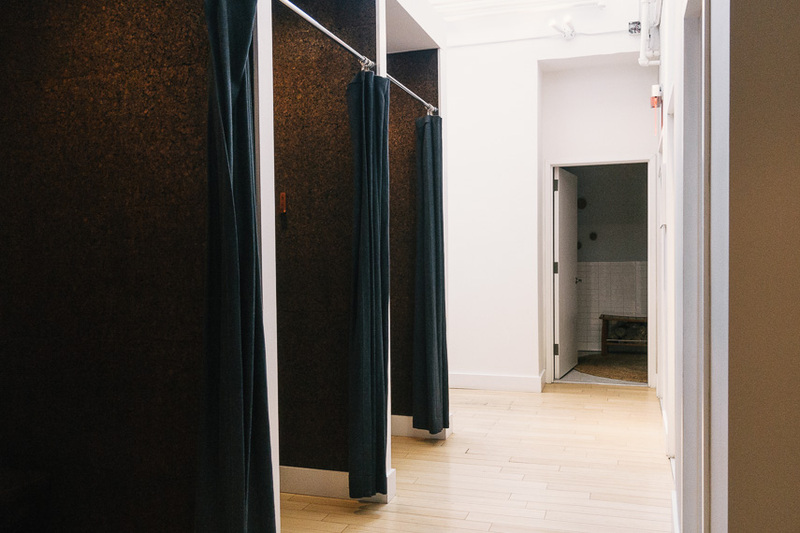 We’re so excited to welcome you to the new Studio 26, Chelsea’s healthy space for a healthy body. See you at the the Big Reveal! Join us on the Mat! We're hosting our first Mat Certification with Balanced Body, Inc. on July 9th + 10th! Come learn from Joy Karley in the Mat 1 and Movement Principals Training Course. Balanced Body Mat I includes an introduction to the history and principles of Pilates, a review of core anatomy, beginning and most intermediate level exercises with modifications, lectures on class order and programming in a fitness setting and guidelines for safely teaching seniors and pre-, and post-natal classes. JUST ANNOUNCED: JEAN-CLAUDE WEST WORKSHOP! Workshop with Kinesiologist + Motor-Learning specialist Jean-Claude West! For more information on Jean-Claude and his work, visit Pilates Anytime or his website. Apply and Sign Me Up! Huge Thanks to VOGUE for the Shout Out in Their City Directory! A lovely listing in VOGUE's City Directory with awesome shout out's to Denise Harris, Lesley Powell, and Jared Kaplan! Lesley Powell joins Studio 26! We're excited to welcome Lesley Powell to Studio 26's growing community of expert trainers + practitioners! 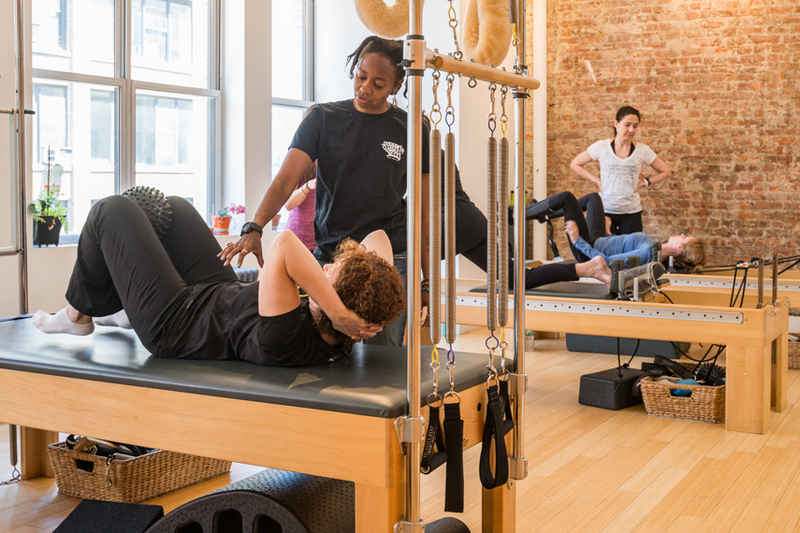 An esteemed movement educator and master Pilates teacher, we're thrilled to host Lesley's private sessions, classes, and workshops. New Year, New YOU! We are excited to be hosting Green Drinks NYC next week! Join Green Drinks NYC at Studio 26 wellness studio for networking, drinks and lots of fun. Bring a friend (or three!) to take a break, mix, mingle and move! Healthy snacks and a speciality cocktail provided by Prairie Vodka! It's the new year and time to get back into the swing of things. After all of the holiday parties, quality time with friends and family, and the decadent food and drink, it's time to shelve the egg nog and break out the sweat bands! Join us for a special green drinks highlighting sustainable fitness and health. It's tough getting back into the healthy routine and keeping your resolutions, so let's do it together! In celebration of breaking-ground on our new space, we're offering a deal, through December 31st: Buy 10 sessions, and get 1 free! Why wait for Thanksgiving? Join us Friday November 20th 3-5pm for fall drinks & snacks: come kick back and hang out with your peers!